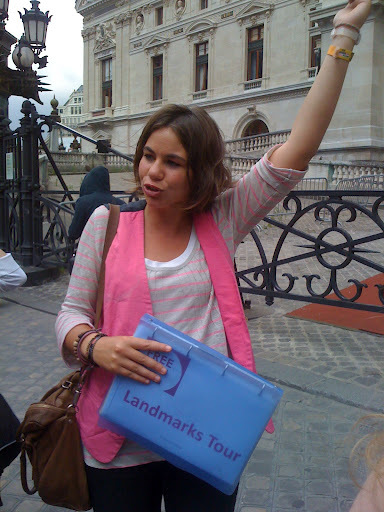 (Paris day six) DISCOVER WALKS, PARIS LANDMARKS. We were a small group, thankfully, Three girls from Egypt, two Aussies, three girls from Vienna. and moi! Nelle told us that if there are more than 20 people they call another guide. So it is good to know ther will never be too large a group. As we started the tour, outside the Opera Garnier,, we were disconcerted by some Roma girls attempting to steal from one of the Viennese girls bags and being foiled by an irate French woman. Just a reminder to me to be careful. Noelle gave an interesting and entertaining tour, taking in the Opera Garnier, the Edward V!! area, Rue de la Paix, Place Vendome, The Tuilleries and finishing up at the magnificent Place de la Concorde with it’s great view of the Arc de Triomphe, Eiffel tower and Champs Elysees and Arc de Triomphe.. Which never fails to impress me. I learned lots, like,….the diamond shops on rue de la Paix are there because the men at the Opera would buy the diamond jewellery from the shops there, to give to the ladies at the Opera.. There are still scratches on the mirrir in Cafe de La Paix where the ladies would test the diamond s to see if they are real. We heard saucy details about King Edward V!!. who built a whole area. Where the first movie was shown and that it was the train film, features in the film Hugo. The history of Place Vendome and the Tulleries, Controversy about the Obilisque and much more. Just for the record I tipped 10euro. IF YOU HOVER OVER THE RIGHT HAND MARGIN OF THE HOME PAGE, IT WILL GIVE YOU A MENU. CLICK ON “FOLLOWERS” OR “SUBSCRIBE” AT THE BOTTOM AND SEE IF THAT WORKS. Previous post ← SOME YOU WIN, SOME YOU LOOSE! Go on a Discover Walk – that's another thing that I still have to do! No matter how many different kinds of walking tours I go on, I always learn something new because each guide has different bits of information about the city that they like to share.It's helpful to know how much you tipped. Thanks!